Inspiration can be found anywhere, I found it at Target! 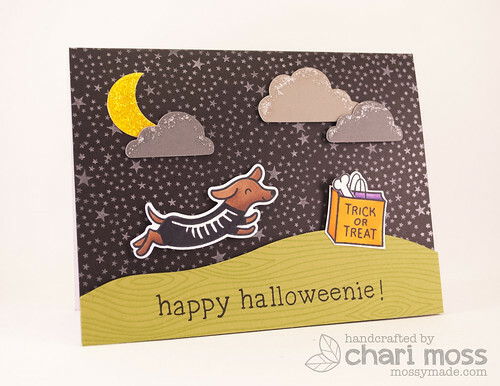 There was a Halloween display in the pet section with a wiener dog in a skeleton costume... and that is what inspired me to make this card! So adorable! Love that star background and wood grain hills! So very cute and creative! Eek!! So so so adorable!! Ha ha ha!! Looooove that sentiment! And your little doxie is too cute for words! Such a sweet, fun, and happy scene!! This is absolutely adorable Chari!! Happy Halloween to you my friend! Crack me up! Fabulously designed card! Your card is so cute and joyful!!! I love it! Greetings from Greece, wish you happy Halloween!!! That card is beyond adorable! Cute and love how you stretch your stamp! So fun and cute!! Totally love it! !